Perfect weather and course makes Spring Back Duathalon successful. Race proceeds benefit the Pink Ribbon Project. 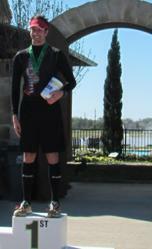 With a winning time of 1:12:15.0, 26-year-old Bryce Fluker scored the best overall course time and won the men’s category in the 2nd Annual Spring Back Duathalon, held in Lakes of Bella Terra on March 4, 2012 in Richmond, Texas. Sarah Cathey, 27, was the winner of the women’s category with a time of 1:31:18.8. Seventy one participants entered the race, which included a 3 mile run through the neighborhood’s Tuscan architect, followed by a 12 mile beautiful ride through Fulshear, Texas, followed by another 3 mile run to complete the race. The youngest participant was 10 years old and finished the course in 1:43:29:1 and the oldest was 68, with a finish of 1:34:18:2. Course athletes relaxed and refueled with refreshments sponsored by My Fit Foods and the No Label Brewing Co. A flat course and picture perfect weather played roles in making the race a success for many. Event organizer, I Tri Event Productions will donate a portion of the race proceeds to the Pink Ribbon Project. Lakes of Bella Terra has been voted “Best New Community in Ft. Bend” twice consecutively. Homeowners enjoy a serenity they say they can’t find at other real estate developments in the Richmond area, as well as custom homes built by Houston’s leading builders, and resort amenities such as the Junior Olympic pool, splash pad, volleyball and tennis courts, state-of-the-art workout facility, expansive green space, lakes and trails, soccer fields and dog park, community-wide events, convenient local shopping and more. Construction of catch and release ponds and walking trails are underway. Lakes of Bella Terra boasts several floorplans including estate homes and family homes from the $160s - $1mil +. View available homes, schedule a tour, and watch testimonials from real homeowners by visiting their website at http://www.LakesofBellaTerra.com. Contact a sales representative at 281-342-9920, or visit the community at 11620 W. Torino Reale Drive, Richmond, Texas, 77406.